A new report by PCS, the union for most staff at HMRC, issued this morning, reappraises the UK tax gap and suggests it was £119.4 billion in 2013/14, and is rising steadily. I wrote the report on PCS's behalf. Building on work I published earlier this year, funded by Oxfam and the Joseph Rowntree Charitable Trust, this new report reviews the three main components of the tax gap and in the process replaces the estimates I made of the tax gap for PCS in 2010. Tax debt: tax that is not paid by a person or a company who knows that they owe it, but who doesn’t pay, or delays payment or which cannot be collected by HMRC. Tax avoidance: tax that is lost when a person claims to arrange their affairs to minimise tax within the law in the UK, or in other countries with impact on the UK. Tax evasion: tax lost when a person or company deliberately and unlawfully fails to declare income that they know is taxable or claims expenses that are not allowed. The amount of debt outstanding has fallen in recent years, but the amount of debt written off as irrecoverable or discharged by HMRC during each year is growing. In 2013/14 the estimate of tax debt is as a result £18.2bn. This is a reduction from the estimate of late paid debt used in 2010 of £25 billion, but since it is now an annual cost and not a point estimate is fully inclusive in the tax gap. HMRC will, of course, challenge this figure, as they do all others in the report. 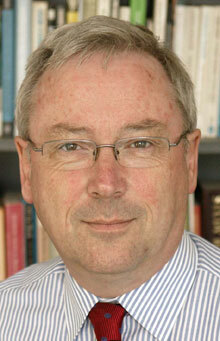 lower than the £25bn estimated in 2008, which reflects declining corporation tax rates (which means the amount avoided also declines, automatically), declining capital gains tax rates, and a likely decline in non-domicile activity as a result of legislative changes as well as caution being made in other estimates. At the core of this avoidance estimate is HMRC's own estimate of tax avoidance and tax lost to legal interpretation disputes, which makes up approximately half the sum. The remainder relates to issues such as the use of permanent establishment rules by the likes of Google that HMRC refuses to consider avoidance even though it at the core of international efforts to beat tax avoidance and other similar issues which have vexed HMRC in the past but which it is refusing to consider as avoidance at present. The fact that the figure has fallen might seem like good news, but when most is the result of falling tax rates there is little to celebrate. Projections are, of course, dependent upon the accuracy of Office for Budget Responsibility estimates of GDP. It will be noted that in some areas I simply accept HMRC estimates of tax evasion: on occasion there is no reason not to do so. The estimates are likely to be sound. This is especially true of errors within the tax system where the IMF noted that HMRC performed well when reviewing their work in 2o13. The IMF were, within the boundaries of the normal diplomatic language they use and the fact that they were consultants on this occasion and no consultant overtly criticises their client, not so complimentary about HMRC's ability to capture data on errors outside the tax system - which, of course, is precisely what most tax evasion is. Here they thought there was room for improvement in HMRC performance and I have explicitly looked for areas where I think this is likely to be the case. My work on the shadow economy has already been discussed and I will not reiterate that here. It will however be noted that I have explicitly identified other areas where a review of data in the economy as a whole suggests that declarations on tax returns are likely to be seriously understated. So, for example, data on both house price sales and share trading suggest declarations for capital gains tax purposes are likely to be heavily understated whilst data on total UK asset worth strongly implies that there must be serious under-declaration of the value of estates for inheritance tax purposes, having made substantial allowance for available reliefs. 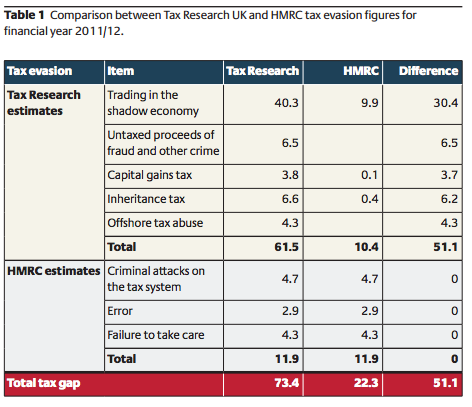 More tax is also likely to be lost to offshore activity than HMRC estimate whilst tax is also lost as a result of criminal activity and fraud in the UK, and although the chance of recovery is particularly low here the failure to record the loss is important: the tax system is intended to deliver greater equality in the UK and all ways in which it fails to do so need to be recorded. Other areas where there is likely to be significant abuse, such as rental income, are explored in the report, but wherever there is risk that an identified non-disclosure has already been covered by activity in the shadow economy new and refined estimates have been excluded from totals to eliminate risk of double counting. The resulting estimate is, I stress, just that i.e. it is an estimate. I am not for a moment seeking to claim spurious accuracy, and in reality the estimates must be mid-points in ranges. As is also apparent from all the work I undertook, I round estimates down, deliberately. What is important then is the difference in the estimate offered from that made available by HMRC and to consider the reasons for this. There are a number of such reasons. The first is HMRC's outright refusal to estimate or even consider some tax avoidance on which they are, however, heavily engaged. Why this should be is hard for most people, include the Public Accounts Committee, to understand. The second relates to debt where the difference between a debt discharge and an irrecoverable debt appears to be down to semantics or a lack of resources to pursue a sum previously considered owing. HMRC need to allocate considerably more resources to this issue, either by having sufficient staff to get their initial debt estimates right, or by having enough staff to pursue debt owing, or by offering better explanation as to how they can write off so much debt without apparent reason give. However looked at this data highlights considerable failure at one or more points in the tax system that imply more resources, better working and more accurate assessment is needed and all justify inclusion of this estimate in the tax gap as a result, which their own estimates gloss over. Third, when it comes to tax evasion, what the estimates I offer really suggest are that HMRC's estimation methods are woefully inadequate. It is simply absurd to estimate losses to tax evasion on the basis of the tax returns that are submitted to HMRC when, very obviously, the failure to submit a tax return at all is the main way in which a tax evader seeks to achieve their goal of non-declaration of tax owing. 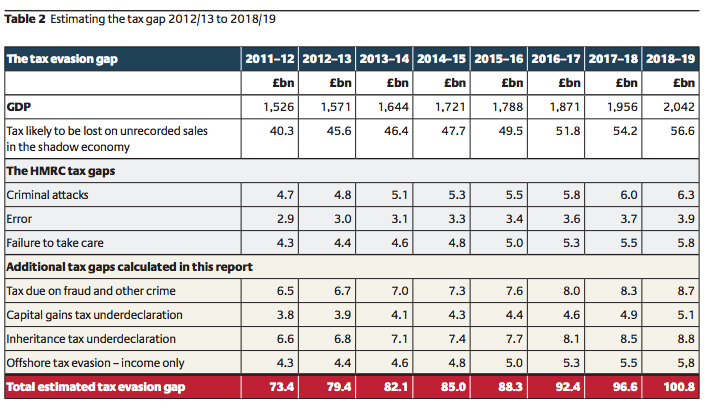 This seems to be so glaringly obvious it should not need pointing out, and yet it has to be, because as a matter of fact HMRC do not look at data outside the tax system to estimate most of the tax evasion gap. It is, inevitably, and seriously, understated as a result due to the most basic of methodological errors on its part that fundamentally undermines the credibility of the data it has to offer. In my work I have sought to look, within the resources and time constraints that are inevitably imposed on me, at the alternative data that is available on which I can estimate tax gaps. These are all detailed in the fuller report that PCS will produce in the next day or so based on my work. Of course there may be better methods to use than those that I have offered, and I have no doubt at all that if more resources were available then these estimates could be refined and made more useful. I am not, therefore, suggesting for a moment that I am offering a definitive answer on the tax gap. What I am saying is that with the resources available to me, and simply using the logic that if you are looking for tax evasion then you have to look for evidence outside the tax system as well as within it or you are inherently and inevitably bound to seriously understate losses, then the estimates I have offered are the best currently available of the amount lost to the UK tax system each year. HMRC will, predictably and with certainty, disagree and ministers will no doubt echo what they have to say, as will right wing commentators on this issue (who seem to think HMRC incapable of anything but estimating tax gaps correctly) but the reality is that it is time for HMRC to take this issue seriously and instead of investing heavily in defending its own inadequate tax gap methodology (as it has done over the last few years) it is time for it to sit down and talk about how its estimates can be improved to take into account the very real, and logical, criticisms I make here. Then we would see progress. And then we might see more tax collected because then it might be obvious to HMRC senior management and ministers like that we need considerably more investment in HMRC if we are to have the fair and just tax system we need in this country that ensures that everyone pays the right amount of tax, in the right place, at the right rate and at the right time, which should be HMRC's goal if it is to not just to collect tax but play its full part in building a tax system that is the foundation of a fair market economy where everyone competes on a level playing field as a well as a fair society where the tax system delivers social justice, not least through redistribution of income and wealth. That should be HMRC's aim. 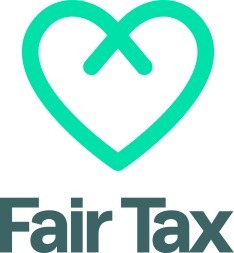 At present it is falling well short of that mark because it has set itself the spurious and inappropriate goal of simply collecting tax at the lowest possible cost, which ignores all the externalities that represent the social consequences of its work, just as its tax gap estimates ignores all the externalities to the tax system itself. If there is a message from this report it is that HMRC's goals need reappraising, and re-estimating the tax gap would be an indication that this process had begun. So why the hell are Labour promising £25 billion in cuts, keeping to the Coalition’s mad, vindictive cutting regime for 2015-17, and being challenged by “serious economic commentators” to “come clean” about what they will cut? I refer back to my quote from Einstein (pace Mr Mowatt, who, for reason unknown, took offence at it) and madness, only this time applying it to the Labour economic team: austerity hasn’t worked, isn’t working and won’t work. Come on, Ed and Ed and Chuka – wise up, and read the runes correctly, those from real economists like Prem Sikka, and those from the Scottish referendum about what people REALLY want, and NEED. Wasn’t your old tax gap estimate 120bn? Which means that with your new estimate the tax gap is falling, not rising? I’m not sure when you made your original estimate of the tax gap, but if GDP is higher now, the tax gap has fallen as a percentage of GDP as well? Isn’t that the issue rather than your pedantry on relativism? So the tax gap isn’t rising then? And all you are worried about is whether it has risen or not? Well given that your headline to this blog is “£119.4 billion and rising” people may conclude that it had increased since your previous estimate of £120bn. In fact if the reader continues down the blog post it is apparent that, even by your own numbers, it is not increasing. Is it too much too ask to expect a headline that is not misleading, still less one that contradicts what follows? Nevertheless, I suspect I am a “right wing troll” – probably a “vile” one, as well, for raising this fairly reasonable point. Your figures are beyond a disagreement with HMRC – they’re quite damning of them. Not exactly a vote of confidence in a significant part of the public sector. You recommend a recruitment drive for HMRC. Fair enough. But I assume you aren’t just wanting more of what we’ve already got. Surely you’d be hoping for a different calibre of employee. What sort of employee do you think they should be getting? And where should they get them from (i.e. where are your desired potential recruits likely to be now)? What are you suggesting HMRC senior management has done, insofar as the tax gap is concerned? Are you saying senior management collected and analysed the data personally? Or are you saying senior management has massaged the figures to suit some end? Or are you saying something else? What is your exact dissatisfaction with HMRC’s senior management (and the root cause of your disagreement with HMRC over the tax gap figures)? Please be clear. That is a damning accusation. You’re saying senior management deliberately chose/approved a misleading methodology to make themselves look good. Wow, yikes, and double wow. Does your full PCS report call for an inquiry into this very serious and scandalous misconduct? I seem only to be getting through to the Executive Summary and couldn’t see any mention of it (I have only skimmed it so far). What do you mean ‘my interpretation’? Do you know for a fact whether any senior executive of HMRC has deliberately intervened to produce a profoundly misleading version of the tax gap, to protect their backsides. Sorry to bang on about this, but you’ve made a serious and important accusation here. You may be right – I don’t know, and I have no brief to defend them. If you are, then it is a scandal that ought to be the headline of your PCS report. String ’em up. I already take what you say a Given. The question is- What to do about it? OK more resources, but they had better be deployed well.I think trained talented staff are probably more important than sheer numbers. I think the first step is some independent oversight,management can’t be judge and jury for their own performance. This alone shows your figure as pointless fantasy. People quite legally reducing the tax they pay are included in your figure of the tax gap. All you are saying is that if the law was changed more tax would be paid. Quite apart from the fact that this isn’t the case (people respond to changes in tax law) you might as well claim that the extra tax that might arise if the top rate of tax were increased to 80% is part of the tax gap. Politely, that isn’t what I said. Is there tax avoidance? Of course there is. It’s legal. It’s undetaken by everyone, including you. But including tax avoidance as part of the tax gap suggests you should be including tax saved on income on investments in pensions and ISAs. But of course, you reject all criticism, whether from individuals, HMRC itself or the IMF (which has endorsed HMRC’s calculation of the tax gap) as nonsense. So who to beleive. Everyone else, or you? Where can I get a copy of the full report? I missed that. Thank you. In your spot-on and intelligent piece, do your GDP estimates include the recent ‘false boost’ to GDP by the EU- permitted inclusion(following Netherlands adoption)of ‘income’ from money laundering, prostitution, illegal gambling etc.? There is obviously an element of tax evasion here, which we both know is not taken a/c of by HMRC. I was wondering why the total tax evasion gap as % of GDP remains practically unchanged going forward. Is it your dismay at inability/unwillingness of HMRC to make inroads into this?.